Are you still worried about how to organize your dirty laundry? Then, Songmics laundry sorter cart is the solution for you. Adopting 600D polyester cloth as the laundry bag, spray hooks and a buckle connection design, this item is very durable and sturdy. With its simple and compact design, it can be placed anywhere in your home. With an advanced painting process, this laundry cart is waterproof, rust resistant and easy to clean. 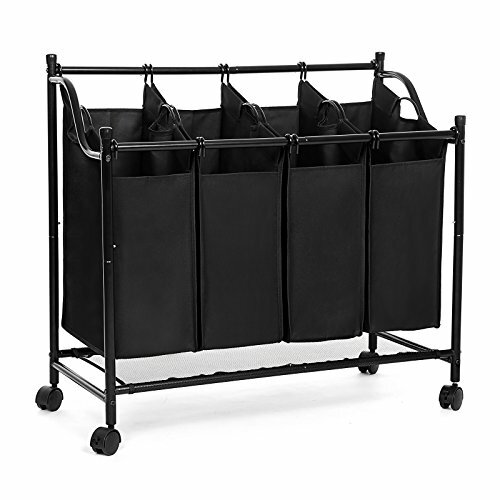 Songmics laundry sorter cart will bring more convenience to your life! - Please wash the bags according to the requirements of its washing label. - Please do not put wet clothes in the bags. - Please do not expose this item to direct sunlight and high temperature environments.